Your ability to keep your elbows together throughout your swing is determine by how flexible you are in your back and shoulders. If there is any tightness in those areas, your trunk will stop rotating and your elbows will spread apart and bend in attempt to get the club parallel at the top of the swing: destroying the arc of your swing. Ideally, you want to work on increasing flexibility and mobility to get your muscles through their full range of motion. But to help accelerate your progress, you can always tie your elbows together to get the feeling of how to turn with the elbows in the proper position. Using a stretch band that you can get at any sporting good store, place it around your elbows as shown. Make practice swings, feeling how your trunk and shoulders rotate without lifting your arms away from your body or spreading your elbows wider than they started at address. Repeat several times, then take off band and try to keep the same feeling. A rounded upper back is often caused by spending long periods of time hunched over a desk or steering wheel. Caused by overly tight chest muscles and weak mid- and upper-back muscles, this can lead to upper-back and neck pain, and poor posture in your golf swing. Strengthening the muscles that retract or pull back your shoulder shoulder blades can help alleviate this problem. Stand in your golf stance holding a club with both hands. Keeping your spine straight, simply pull your your shoulders back as you squeeze your shoulder blades together. Hold position for a moment and then release, returning to the start position. Making practice swings instead of hitting balls is a better way to improve your swing technique. If you are trying to learn the swing or make a swing change, rehearsing the move without hitting a ball will assure that you are actually doing the correct move. Repeating the motion that you want to achieve will help ingrain the move into your real swing. The single most important moment in the golf swing is impact, and if your position is bad when you arrive there you’re in trouble. For many average and higher-handicap golfers, their impact issues are caused by flipping their hands at impact instead of maintaining lag and forward shaft lean. Ideally, you want to hit the ball with, not just your hands, but with your bigger muscles. What some call a full body swing-where the core muscles rotate and control the arms through impact- recruits bigger muscles to produce the swing. You create more power with faster clubhead speed and less effort. Here is a drill to help your impact position. Set up to hit a shot with your Shortee Club. Swing to the top and then swing down to impact. Stop at your impact and hold position to check clubface. Keep your abdominal muscles pulled in and keep your spine angle. Simulate your golf swing as much as possible. 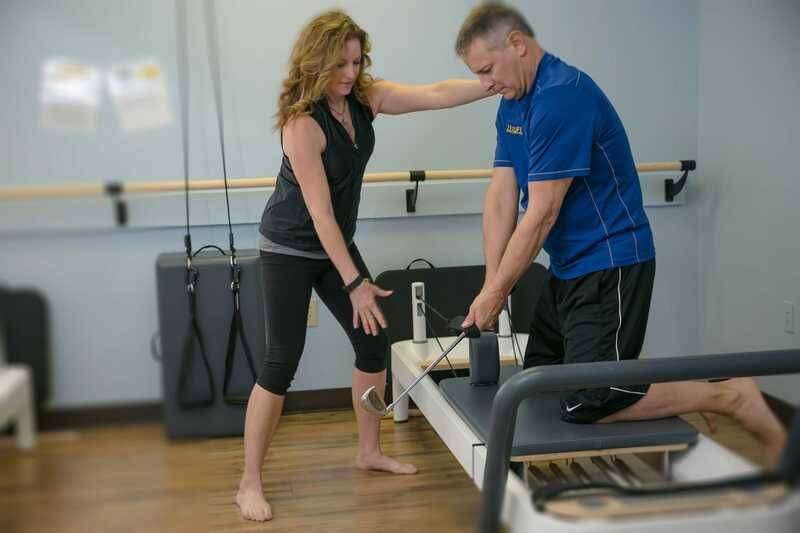 Cardiogolf Creator, LPGA Teaching Professional, Golf-Fitness Specialist and Certfied Pilates Instructor Karen Jansen teams up with 15 to Fit Pilates, Barre and Fitness to help you take your game to the next level. 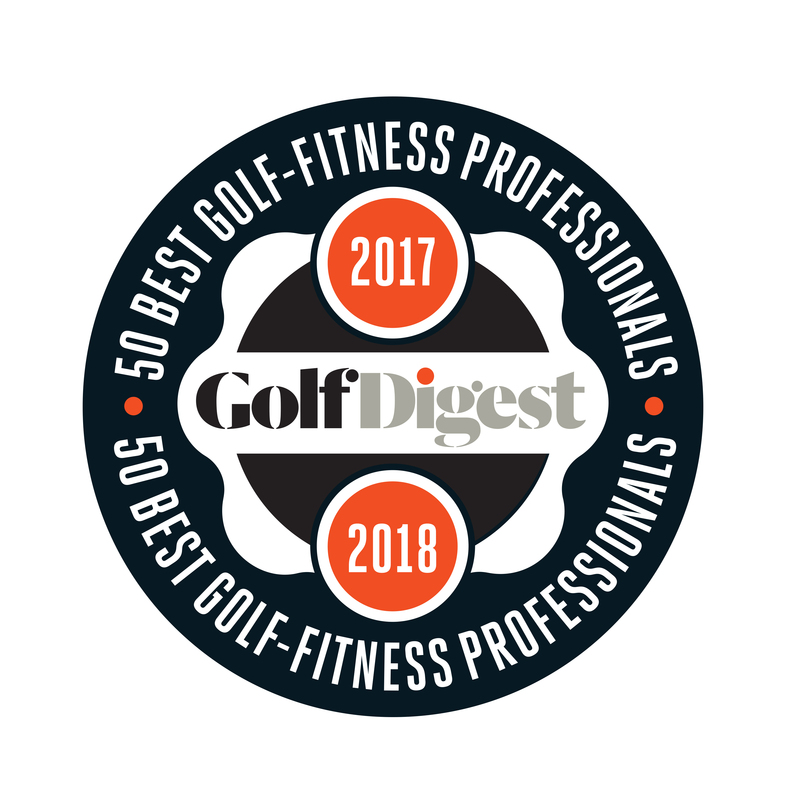 Karen will design an individualized golf-specific workout program for you combining Pilates reformer exercises with her unique Cardiogolf fitness program to help you improve your core strength, posture, balance, flexibility and swing technique to build more a powerful and repeatable golf swing. Just do it. Sometimes you just have to bite the bullet and do things you don’t feel like doing. It is easy to skip exercise because you are tired or you have other things to do, but don’t do it. If you can’t do it every day, don’t punish yourself and give up. Just do it the next day. If you do 30 practice swings a day for 30 days, you’ll have done almost 1000 swings and be on your way to grooving a consistent swing. Click here how I practice indoors with my Cardiogolf Shortee Practice Training Club. Take the challenge with me, post a note on my Facebook page letting me know that you are up for the challenge. If you have limited side bend, then you will also be limited in your spinal rotation because one motion cannot happen without the other motion. Any limitations in this area will cause you to slide or sway in your golf swing. Improving your range of motion so you can side bend will help you make a better backswing and improve your swing plane to be more consistent. Stand in a shoulder width stance. Keeping your back, head and shoulder in the same line with your arms hanging by your sides. Bend to the side and reach your fingertips to the floor as you side flexion. Go as far as you can without losing your balance. Hold position for 8 to 10 counts and return to start position. Managing your food intake, hydration levels and adding certain nutrients to your diet can not only help you concentrate and focus more on the golf course, but it can also help you keep your heartbeat steady as you make an important shot or putt, help your muscles fire faster for more power, help you fight fatigue so you can play and practice longer and even help you keep your cool after a bad shot. More importantly good nutrition is good for your overall health and well-being. We all know the importance that fitness, swing mechanics and equipment can have on our golf games, but are you eating the right foods to sustain enough energy throughout your round to play your best golf? The best equipment in the world won’t make a difference if you don’t have energy to get you around the course. 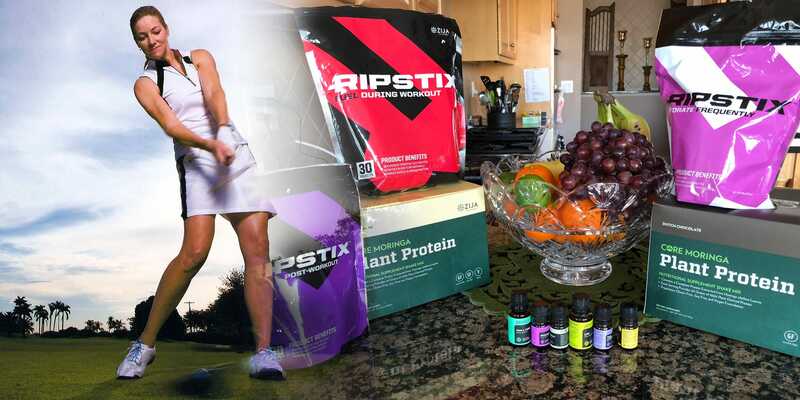 We do not hear as much about nutrition for golf, but rest assured that the most elite golfers of the world follow some sort of diet to provide them with the energy-output they need to play their best. While is it not yet the norm for golfers to follow a specialized nutrition program, it will soon become so. For many of us, we used to be able to hop out of the car, go straight to the first tee and rip a drive down the middle of the fairway. Now by skipping a warm-up before a round of golf may mean it takes us 4 or 5 holes before you loosen up and gain your form and by that time your score may already be ruined. Here is a quick and easy pre-round warm-up exercise to help you avoid those big numbers on the scorecard. The point of a warm up is to elevate your heart rate to get your blood flowing to warm muscles so they are loose and supple to make it is easier to swing. You can do this warm-up at your house before your round of golf, if you don’t have a long drive to the golf course or on the driving range. Don’t be embarrassed to do the routine, it couldn’t more humiliating than topping your drive off the first tee. Here is a quick exercise that I do to help warm up the back and shoulders. If you work at a desk job, most likely your shoulders will be tight from the hours of sitting at a desk over a computer. When your shoulders are tight, then you cannot make a full shoulder turn and this may lead to swing faults. Bicycle arms is an excellent exercise that will not only loosen muscles but will help you develop strength and endurance. 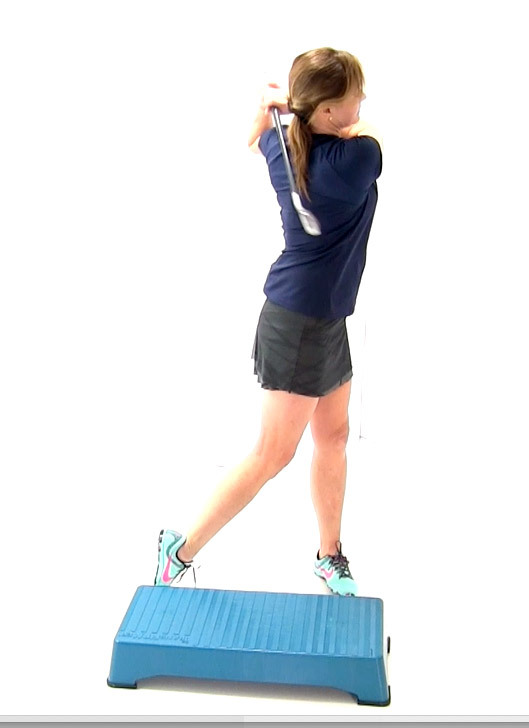 Stand in a shoulder width stance holding a golf club parallel to the ground. Rotate the club forward as if you were peddling a bicycle with your hands and arms, taking your shoulders through full range of motion. Rotate forward for 8 to 10 repetitions and then rotate back for 8 to 10 repetitions.